Has the present perfect gone missing? Guy Keleny, writing the Errors & Omissions column for the Independent, declares that those slovenly Americans are stealing the present perfect tense from the English language. He objects to a usage in his own paper: "Rather than meeting up and talking about what we want to post online, we just add to what someone – maybe on the other side of the world – already wrote." Any time up to about 10 years ago any British writer would have said "add to what someone has already written" [my italics]. Under the influence of American usage, the present perfect form of the verb ("has written") is losing ground to the past simple ("wrote"). In British English, the past simple merely signifies an action in the past, whereas the present perfect describes a state of affairs in the present brought about by an action in the past – we now are in a world where somebody "has written". American English, with only the past simple to call on, fails to mark that distinction. Have you noticed the disappearance of the present perfect in American English? I have not – though of course I've seen "he wrote" in casual contexts where more formal prose would call for "he has written." Is the present perfect really "distinctively British," as Keleny's headline claims? Is its use diminishing in British English, and if so, is it Americans' fault? I'm not good enough at Zimmering* to test these assertions properly (and I'm about to be off the grid for a bit), but perhaps one of the adepts – Mark Liberman or Ben Zimmer himself – can show me how it's done. Or maybe Keleny will reveal his evidence. But I suspect his lamentation is based on mere sentiment, seasoned with a dash of prejudice. *"Wait, I'm not ready to be an eponym!" Zimmer tweeted in response to this coinage. Too late, Ben! I almost hate* to give Geoff Pullum another reason to rant about the offhand contempt with which mainstream journalists treat the vocabulary of language and grammar (see: passive voice). But how could I resist this? 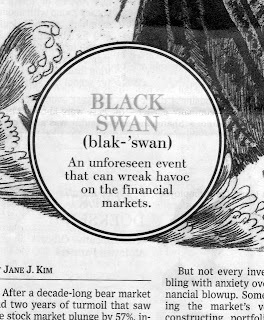 In today's Wall Street Journal, the designer/editor team decided to represent "black swan" as a dictionary entry, pronunciation and all, apparently without consulting an actual dictionary. This is the pitiful result. -- Black swan isn't a closed or a hyphenated compound, so that hyphen in "blak-swan" has no excuse to be there. -- Black swan (for me, anyway) has equal stress on both words, like black tie or black ops. So if that misbegotten apostrophe was drafted to play to role of a stress mark, it too is superfluous. -- And finally, the graphic simply ignores the difference that every dictionary would indicate with a special symbol (or two): the difference between the a of black and the a of swan. Here, they're shown as the same sound -- as if "black swan" rhymed with "black man." (Or, given the stress on the second word, with "black-MAN." Long ago, once of my favorite designers replied to a complaint about a similar problem by telling me the unorthodox typography was "a design element." But I notice the WSJ doesn't treat the big red + signs and % signs in its graphic as "design elements" -- no, those mean just the same thing they always do in business journalism. But lexicographic symbols -- pffft, whatever, who cares. The Times's usage blog, After Deadline, mostly addresses the routine matters of house style and word choice -- though its author, Philip Corbett, did draw wider attention recently when it got about that he had recommended replacing tweet with "post a Twitter update." This week's edition didn't go that far, but it issued several tin-eared rulings, starting with Corbett's objection to the paper's increased use of hipster. "As a colleague pointed out, we’ve used it more than 250 times in the past year," he said -- you'll notice it wasn't a reader who complained -- and to him, that number implied an unseemly striving for hipness. Next he condemned the punctuation in the sentence "WikiLeaks was more than just a source, it was a publisher." The problem? "Even in the conversational style of a blog post, this is a 'comma splice.' The two independent clauses need a dash, semicolon or period in between." And then he invoked a Times usage rule that almost nobody observes, objecting to "the woman, who … had just been diagnosed with lymphoma." Because "as the stylebook notes, the disease is diagnosed, not the patient." Usually, I find this column a delight, but today I disagree with Mr. Corbett. At least in its post-2005 "hipster" has a specific meaning that may have some disagreements around the margins but is generally understood. Yes, it's gained in frequency but that is because of its growing popularity (and the ensuing backlash.) Would we have wanted to give yuppie a "rest" in the 80s or look for "alternatives" to hippies in the 60s. I think the New York Times's goal should be to educate rather than obscure in code. I respectfully disagree on the comma splice example; it reads perfectly as is. Follett’s Modern American Usage gives the following example as "legitimate splicing by commas": "This was not only his first concerto, it was his best." Most grammarians believe that some comma splices are justifiable, especially those connecting short, related (independent) clauses. As a physician who writes, for years I resisted “diagnosed with” as applied to a patient. At last, I’ve given it up. It has rooted itself deep in the lexicon, and it does serve the useful purpose of shortcutting an otherwise more convoluted locution (the patient was diagnosed as having, was told he/she had, &c). Garner’s Modern American Usage (2003) notes … "This idiomatic syntax is too common to be called erroneous." Way to go, readers. I had just about sworn off reading newspaper comments, but if debate like this can prevail over peevology, I'll be happy to reconsider. Like the folks who imagine that Ms. was coined by a feminist cabal, English journalist Robert Fisk believes that his editor's rejection of poetess is a modern, women's-libber prejudice, part of the "grammar of feminism and political correctness." Over at Language Log, Mark Liberman (here) and Geoff Nunberg (here) have already set him straight. To their learned rebuttals I would like to add a commentary from Edward S. Gould, American language maven and author of "Good English" (1867). Gould was not alone in his dislike of feminized nouns, but he devoted more space to the issue than most usage writers. He conceded that some such words (marchioness, princess) might be needed, and that others, like actress and patroness, were traditional, though "a good reason can hardly be given for their admission into our vocabulary." 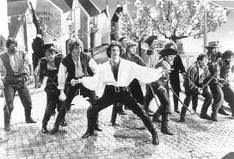 But many coinages, he said, were absurd, including poetess and authoress. If, however, those two words have, by long usage, become conventionally endurable; what shall be said of the superfine affectation, prettiness, and pedantry of conductress, directress, inspectress, waitress, and so on, which have become as plenty as blackberries? Conductor is a person who conducts; director, a person who directs; inspector, a person who inspects; waiter, a person who waits. Yet if the ess is to be a permitted or an endured addition to those words, there is no reason in language or in logic for excluding it from any noun that indicates a person; and the next editions of our dictionaries may be made complete by the addition of writeress, officeress, manageress, superintendentess, secretaryess, treasureress, singeress, walkeress, talkeress, and so on, to the end of the vocabulary. Is there a "bite" in "respite"? The skies over the capital have cleared, a welcome rest bite for thousands of people doomed to spend sweltering nights in overheated apartments. One commenter suggests (plausibly, I think) that "rest bite" could be formed by analogy on "sound bite," to mean a brief period of relief from exertion or hardship. But what surprised me was that the pronunciation with second-syllable stress (res-PITE, ruh-SPITE, ruhs-BITE, whatever) was common enough to produce such an eggcorn. Yes, I know the variant is out there -- Elster's "Big Book of Beastly Mispronunciations" says it has a "long and tarnished history" -- but I don't think I ever hear respite with second-syllable stress (in "respite care" and the like). Since y'all were so informative (not to mention impassioned) on the pronunciation of often, maybe you could enlighten me about the local renderings of respite you hear, and what you think of them? Turning out the lights on conditional "might"
Conditional sentences stating something contrary to fact ... need might: If pigs had wings, birds might raise their eyebrows. Cheered though I was by such conviction, however, I'm more certain than ever that this use of might is circling the drain. When I blogged about it (at the Globe's Boston.com website) last December, I noted that the New York Times officially supports my position, but the Cambridge Grammar of the English Language thinks it's time to let it go. Almost nothing we’d done to Sara -- none of our chemotherapy and scans and tests and radiation -- had likely achieved anything except to make her worse. She may well have lived longer without any of it. Might well have, you mean. Oh, well. *In the printed version of the piece, there was also a more obvious problem: A girl's name was given as both Ashlee and Ashley within the space of a few paragraphs. The web version has fixed that, but left "may well have lived longer" as is -- which must mean that even New Yorker readers don't mind it. He holds his nose at "transition" used as a verb. Ditto for "impact." "I can’t stand 'lay' and 'lie,'" said Kline. "No one lays down. They lie down. And then there are hyper-extensions like 'I' instead of 'me.'" I'm gonna go ahead and hope it's a transcription error. Even if he deserves it, I'd hate to see my favorite Pirate King brought low by McKean's/Skitt's/Hartman's Law of Prescriptivist Retaliation. A premature elegy for "eavestrough"? I've been in Ohio for a while, enjoying family festivities and, as I always do, renewing my acquaintance with my native dialect. So it was an especially appropriate time to read the Newsweek piece by Joan Hall, chief editor of the Dictionary of American Regional English, on the progress of that wonderful (and almost complete) 45-year-old project. DARE's research, wrote Hall, shows that despite popular belief, mass communication has not wiped out local varieties of English. However, she said, "Certain regional terms have been weakened by commercial influences, like Subway’s sub sandwich, which seems to be nibbling away at hero, hoagie, and grinder." 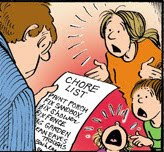 This reminded me of the "For Better or Worse" cartoon above, from June 13, in which John is given a honey-do list that includes "Clean eaves troughs." (I write it as one word, myself, but I see the spellchecker doesn't approve.) Eavestroughs was a common synonym for gutters when I was young, but like the regional names for submarine sandwiches, it seems to have been marginalized by national advertisers, who made gutters the generic term. DARE's map shows eaves trough (also known as eave trough and eaves troth) widely disseminated across the Northern states and throughout California, though not in Eastern Massachusetts. The dictionary quotes a 1961 comment from the journal American Speech: "Eaves troughs and eaves … trail far behind the commercial term [=gutters]. Their markedly greater use by [older] informants suggests that both terms are on the way out." Maybe, maybe not. Lynn Johnston, creator of "For Better or Worse," is Canadian, and thus not on DARE's map, but apparently she's been living in dialect regions where eaves trough continues to thrive. *Thanks to Visual Thesaurus and to Mr. Verb for the link.